In some cases, one or more restore points in the backup chain may be not accessible. This can happen, for example, if the backup repository is put to the maintenance mode (for scale-out backup repositories), the backup repository is not available or some backup file is missing in the backup chain. Backup chains that contain missing restore points get corrupted — you cannot perform backup or restore VM data from the missing restore point, and restore points that depend on the missing restore point. Forget — you can remove records about missing restore points from the configuration database. Veeam Backup & Replication will “forget” about missing restore points and will not display them in the console. The backup files themselves will remain on disk (if backup files are still available). Remove — you can remove records about missing restore points from the configuration database and delete backup files from disk (if backup files are still available). 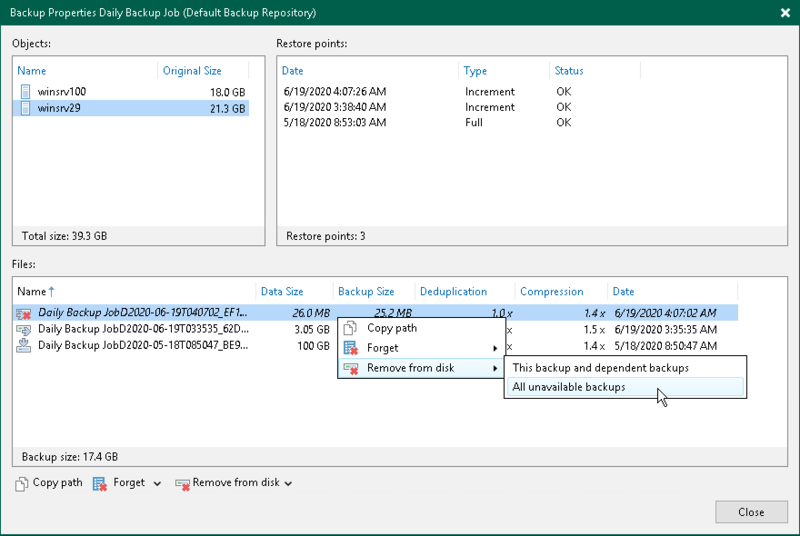 The Forget and Remove from disk options are available only for restore points that are missing from the backup chain or points that depend on missing ones. If the restore point is available in the backup chain and does not depend on a missing restore point, you will not be able to use the Forget and Remove from disk options for it. 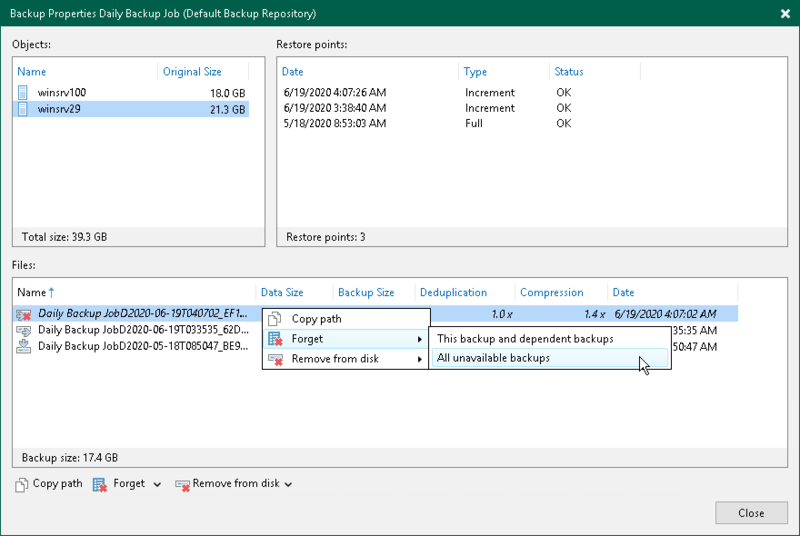 Veeam Backup & Replication may require some time to update information in the configuration database for restore points that were removed from a backup chain or became inaccessible. Therefore, such restore points may not be displayed in the console as missing restore points. To overcome this situation and reveal missing restore points, you can update information in the configuration database manually. To do that, disable the associated backup job and rescan a backup repository that is configured as a target for this job. In the inventory pane, select Disk under Backups. In the working area, select the backup and click Properties on the ribbon or right-click the backup and select Properties. In the Backup Properties window, right-click the missing restore point and select Forget. To remove only the selected restore point and restore points that depend on it (that is, a part of the backup chain starting from this restore point), select This and dependent backups. To remove all missing restore points, select All unavailable backups. In the inventory pane, click Disk under Backups. In the Backup Properties window, right-click the missing restore point and select Remove from disk.